There is something stirring in Philadelphia. On the heels of their first mini-tour, the Philadelphia-based, Temple University trio Mo Lowda & The Humble is beginning to disrupt the music scene in the Northeast. The group has all the makings of an alternative-rock band with lead singer and guitarist Jordan Caiola, drummer Shane Woods and bassist Nate Matulis. But if you're going to ask these guys what their genre is, there will be a pause for thought. "It's tough, because our whole mentality is that we never really want to get lumped in with a given genre or style," Matulis told The Huffington Post. "The easy answer is alternative rock or progressive. We've got so many different influences coming in from every end of the spectrum, so it makes it very hard to really define our sound simply." Those influences include names you rarely hear lumped together: My Morning Jacket, Led Zeppelin, Neil Young, Jaco Pastorius, Pink Floyd and Victor Wooten, among others. As peculiar as their influence is their name, which all but happened by accident. "When bouncing ideas off of each other over the phone, Jordan suggested 'Mo Lowda & the Jungle', which Shane misheard as 'The Humble.' The name stuck," Matulis said. "We like to think that our sound is kind of described by the name of the band: abrupt shifts between a heavy, 'Mo Lowda' part and softer, stripped down 'Humble' parts." "I like how we influence each other," Woods added. "We all listen to so much different music and take from a lot of different places." While Mo Lowda & The Humble's unique fusion of sound has hooked its earliest fans, comparisons to one band -- Kings of Leon -- seem to follow the group around. "Honestly, it gets exhausting, but it is in no way insulting," Caiola, who handles the brunt of the song writing, said. "People just like to be able to put their finger on a band's sound and the easiest way to do that is by comparing them to other, more well-known artists. If you listen to enough of our stuff and enough Kings of Leon, you can hear there are major, major differences in our styles." 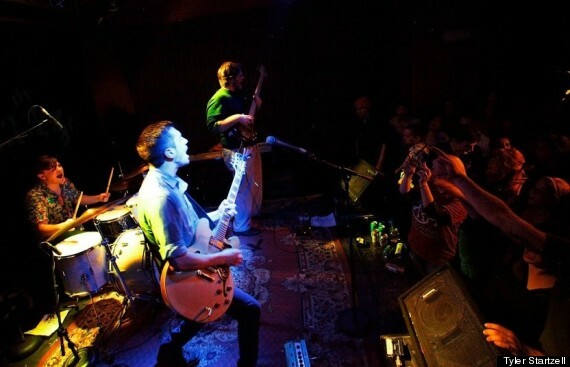 The band grew their claws playing on Temple University's campus, where they first attracted classmates and friends while playing at a weekly open-mic night hosted by Maxi's bar. Slowly, the group began showing up at house parties and local bars, blowing away anyone who came in with the expectations one has for a free concert. "Temple University itself gave us a huge helping hand when we were signed to the school's student-run record label," Matulis added. "Jeff Sarafinas, an extremely talented producer, recorded our entire 'Curse the Weather' album for free. Can't beat that." Although you may have never heard of them, the group is starting to collect plenty of resume-worthy accolades. Deli Magazine and 93.3 WMMR have both given them artist of the month awards. They got to perform at a HotBox Session, where they played "Runaway," one of their first fan favorites. Amped Sounds Magazines called "Curse The Weather" 2013's album of the year, and the highly respected Philadelphia radio show Preston and Steve hosted them on air for a live performance just last month. "We don't really get nervous anymore for shows, but we were definitely nervous for Preston and Steve," Woods said. "We constantly have people approaching us at shows who found out about us through Preston and Steve. We're forever grateful to those guys over there." Now, this group of high school friends is starting to gain some momentum. The band is regularly booked across Philadelphia, and with each show there are more and more people singing along to the lyrics, always a good sign for a rising group. Looking forward, Mo Lowda & The Humble is already writing for their next album, and officially on the market for management. In all likelihood, whatever comes next for this group will be a reflection of their hard work and openness to change. "I feel like there is always room for growth," Caiola said. "Even with the new songs I'm writing after the release of 'Curse the Weather,' I think they are a totally new ball game." Nobody seems to get tired of Spice Girls reunions. The girls forst got back together in 2007 for a year of touring and then again in 2012 to perform at the London Olympics. But in 2014, which marks the 20th anniversary of the Spice Girls, fans are hungry for at least one more chance to zig-a-zig-ah. Now they just have to get Victoria Beckham onboard.